We are at a point in the NHL season where most teams have played between 15-17 games. This means that we are approaching the 20 percent mark of the regular season. So far, we've seen some crazy games, some absolute duds, some highly-skilled individual performances, breakout stars like Elias Pettersson of Vancouver, and two coaching casualties. We have had some great stories like the Ottawa players talking crap about one of their coaches, and Brian Boyle scoring a hat trick on Hockey Fights Cancer night in Pittsburgh. To say the NHL season to date has been anything short of entertaining would be a complete lie. As we approach mid-November, I felt like now would be an appropriate time to run through my NHL power rankings and see where we stand in the futures odds as well. All odds are courtesy of Bovada . 1. 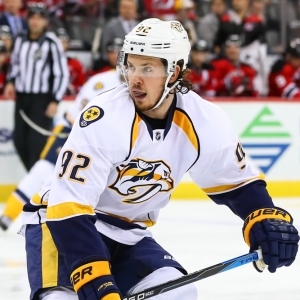 Nashville (+700) - At 12-3 the Nashville Predators own the best record in the NHL. They've won four straight and have outscored their opponents 13-3 in that span. They are winning games with timely goaltending, a solid defense group and a collection of highly-skilled, yet under-the-radar forwards. Another Presidents' Trophy is likely on the horizon. 2. Tampa Bay (+650) - The Lightning are one point off the Predators for the Presidents' Trophy, with a record of 11-3-1 for 23 points. They have a well-balanced roster and one of the best goalies in the league. It wouldn't shock me to see the Lightning in the Cup Finals come June given their consistency over the past few seasons. 3. Toronto (+500) As Cup favorites, the Maple Leafs have impressed me lately, given how they've played despite missing their No. 1 center, Auston Matthews. The Leafs defense has been better, but they still give up too many chances. If one team can score their way to a Stanley Cup, it's this team. 4. San Jose (+1200) - The Sharks went all in this offseason by acquiring Erik Karlsson from the Ottawa Senators. After a sluggish start, the Sharks are now 8-4-2 and have won six of their last 10 games. This is a team that nobody takes notice of because they play on the West Coast, but let me tell you something - they are really good. 5. Colorado (+2500) - Colorado has quietly gotten off to a good start, posting a 7-5-3 record. They have one of the best lines in the NHL with the Gabriel Landeskog, Nathan MacKinnon, and Mikko Rantanen trio, with Rantanen leading the NHL in scoring with 24 points. However, they've lost four straight, but they have faced stiff competition. This team will be in the playoffs come year's end. 6. Washington (+1700) - The Capitals are treading water early in the season, posting a 7-4-3 record. At times they've looked like defending Stanley Cup champions, while other times they've looked lost and still hungover. It's a long season, but the Caps will make the postseason. They just need better goaltending and team defense as they've allowed 3.5 goals per game so far this season. 7. Minnesota (+3000) - The Wild are a quiet 8-4-2. I say quiet because nobody takes them seriously, not even me. They are a team without any real household names, aside from Zach Parise and Ryan Suter. Suter, a defenseman, is tied for the team lead in scoring with 13 points. That about sums it up. The Wild win games with their defense and goalie, and to most that's boring. However, to the Wild it means success. 8. Winnipeg (+1200) - Last year's Western Conference finalists take up the No. 8 spot in our power rankings. They just split a pair of games in Finland against the lowly Panthers, but boy did they ever look bad. They were slow and were out-chanced by a million - so it seemed while watching the game. They have one of the fastest teams in the game, but only time will tell if they can duplicate last year's success. 9. Boston (+1200) - Boston is 8-4-2 on the season and has points in seven of their last 10 games. The goaltending has been better of late, but they are missing a few key cogs throughout the lineup. So, when they get fully healthy, they will be a force once again. They still have one of the best lines in hockey with Brad Marchand, David Pastrnak and Patrice Bergeron, who've combined for 24 goals, 29 assists for 53 points. 10. Montreal (+3000) - The Montreal Canadians are a generous 8-5-2 this season. They've done well when they forecheck the hell out of their opponents, which leads to mistakes and turnovers, but they also make plenty of errors themselves. They have one of the best goalies in the league in Carey Price, but even he is starting to look worn out. You can only go all out 100 percent for a short time, and I believe the Canadians will fade mightily over the next batch of games. 11. Calgary (+2500) - The Calgary Flames had more questions than answers coming into this season, and after a 9-6-1 start to the year I am a believer in what they are doing. They have a solid roster but will need to upgrade in net (if possible) if they want to make a run this year. 12. New York Islanders (+8000) - The Islanders lost their best player and captain this past offseason when John Tavares signed with the Maple Leafs. The Islanders have responded by posting an 8-4-2 record early on. However, if you are into advanced stats and metrics, this team is about as fluky as they come. They are constantly getting outshot and out-chanced, so it's only a matter of time before the roof comes caving in. 13. Dallas (+3000) - The Stars own an 8-6-1 record but just finished up a four-game road trip by losing two straight to Boston and Columbus. It doesn't get any easier for the Stars as they must play San Jose and Nashville in their next games. The roster is good, but the scoring can be non-existent for extend periods of time. That'll need to change in a hurry. 14.Vancouver (+7500) - When you get compared to Pavel Bure or Alex Mogilny, that must mean something. And for Elias Pettersson, the Canucks fifth overall pick in last year's draft, that must mean you are producing and leaving writers and commentators speechless. Pettersson is leading the Canucks in scoring with 16 points, and the rest of the team has played well enough in support to push the Canucks to a 9-6-1 record. This is still a young team, so it'll be interesting to see if they can maintain this level of play. 15. Pittsburgh (+1500) - Something is clearly wrong with the Penguins, and it won't be long before a trade is made or the coach is fired. Look, this team is top-heavy in terms of talent, but the rest of the team is bad. They are getting poor goaltending from their goalies and have lost five straight, getting outscored 21-7. This club has seen better days. 16. Edmonton (+2200) - After an 0-2 start, the Oilers are 8-4-1 and have looked like the team we expected them to be last year when they fell short of expectations. Connor McDavid is still the best player in the NHL. And with him in the lineup on a nightly basis, there's no telling how far the Oilers can go with him leading the way. The defense still has issues. But, then again, 28 other teams in the league have some sort of glaring weakness as well. 17. Arizona (+10000) - It was a long season in the desert last year, and early times this year have proved promising. The Coyotes are 7-6-0 and have shown us the ability to score goals in bunches. Despite that, it's still a long shot to make the postseason, but times are looking up in Arizona, even if the arena still isn't filling up. 18. New Jersey (+5000) - Taylor Hall is good. This we know. The rest of the team, not so much. The Devils got off to a fast start but have tailed off recently, losing seven of their last nine games. In those losses, they've given up at least four goals in all but one, which tells me the once 'defense-first' Devils team of the past is no more. 19. Buffalo (+5000) - Picked by many for positive regression, the Sabres are 7-6-2 but have lost four of their last five games. Their best player is Jack Eichel, and he has been playing like it, but the secondary scoring is missing in action on most nights. Still not sure what to make of Carter Hutton as a No. 1 goalie, but I will give him more than 11 starts before I come up with my final decision. 20. Philadelphia (+4000) - The Flyers are about as inconsistent as any team on this list. Just when you think they've turned the corner by coming away with an impressive two points, they fall flat on their faces. The Flyers have a good group of players, and a roster that should take them to where they want to go. The problem is the goaltending, something that's been the Achilles heel of this team for the last decade. 21. New York Rangers (+10000) - The Rangers are 7-7-1 thanks to a four-game winning streak. There isn't much to like about this team, though, as they have an aging goalie and an aging defense grouping. They struggle to score goals, averaging 2.67 per game (26th overall) and have terrible special teams play. 22. Carolina (+5000) - The Hurricanes were everyone's sleeper pick to make noise this season and be a playoff team. A month into the season, the Canes are 6-7-2 and sit seventh in the Metro Division. They've lost five straight games, getting outscored 16-7. The Canes have a good collection of young players but are still several pieces away from being taken seriously. 23. Columbus (+2500) - Whether you love John Tortorella or hate him, there's no denying that there is always drama around him. Columbus should be a better team given their roster, but they always seem to underperform. An 8-6-1 start is reasonable, but consistency needs to get better if the Blue Jackets are going to be taken seriously. 24. Vegas (+2500) - Vegas isn't catching teams by surprise this year. At 6-8-1 the Golden Knights have had issues scoring goals and defending. It doesn't help that their three main offseason acquisitions are injured, but nobody has stepped up in their absence. They look like an expansion team this year. 25. Anaheim (+4000) - This team is smoke and mirrors. They may be 7-7-3, but this team scores 2.35 goals per game (29th overall), puts 25.5 shots on net per game (31st) and gives up 37 shots per game (30th overall). If it wasn't for their goalie, they could be a two-win team. That level of play is simply unsustainable, so look for the Ducks to take a nosedive rather quickly. 26. St. Louis (+4000) - The Blues are 5-5-3 on the season and have won three of their last four games. This is a team that has the ability to score goals in bunches but can't ever seem to get a big stop from their goalie. Kind of like Philadelphia. Eight of their next nine games are against playoff teams from last year, so the urgency to play well doesn't get any higher than that. 27. Florida (+7000) - Florida has played just 11 games this season. That's six fewer than Anaheim, who has played 17. They've been off for a week after splitting a pair in Finland against Winnipeg. Talent is there, but they've had trouble scoring timely goals. 28. Ottawa (+30000) - The fans want the owner to sell the team. The players were caught talking bad about one of their coaches, and yet somehow the Sens are sitting at .500. The team has talent. However, it's about consistency, and that's one thing the Sens simply don't have. 29. Chicago (+3500) - Losers of five straight, the Blackhawks made a coaching change, firing the coach that led them to three Stanley Cups since 2010. This should light a fire under their asses. This is also too talented of a team to be ranked this low on the list. Better times are coming for Chicago. 30. Detroit (+50000) - Not much positivity to report out of Detroit. They own a 5-8-2 record and have trouble scoring goals. There are no household names on the roster, and the prospect cupboard looks bare as well. 31. Los Angeles (+6000) - The Kings sit at 5-8-1 on the season and recently made a coaching change. That change should help spark the team, as they have won two straight games by identical 4-1 scores. The west seems like the tougher conference, so the Kings will need to go on a run to get them back into the playoff race. DOC'S SPORTS HOCKEY is 6-1 over his last 7 selections for a profit of +2420. He is releasing a massive 7-Unit NHL Play tonight and he expects to make it 7 winners out of his last 8 selections. Puck drop is set for 8:35 pm. This is a selection you DO NOT want to miss out on. Click BUY NOW and secure your profit tonight .